The most anticipated meal of the trip was the biggest miss of the trip. We are far from Minetta Tavern! Bouchon Bistro is a Thomas Keller restaurant in the Venezia Tower of the Venetian, offering classic French bistro fare. One of the most popular dining options in Vegas for both brunch (famous for its chicken and waffles) and dinner (famous for its… bread?). 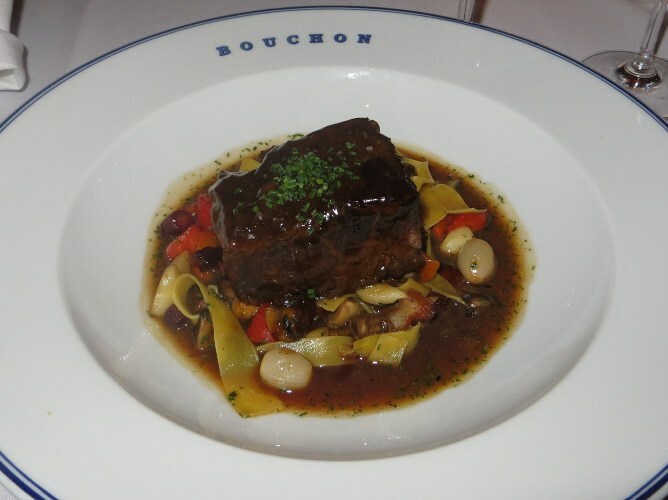 My mission as the foodie and food blogger of the 12 person group traveling with us was to choose a place to celebrate a friend’s birthday and after much consideration and keeping costs in mind I chose Bouchon for this special event. It started off quite nicely. Beautiful private room, nice ambiance and everybody happy. The bread arrived after a while and WOW.. some of the best bread I’ve had this side of Villefranche Sur Mer. I love good bread and butter and this is as good as it gets. An app of mussels arrived chilled was very good, and a nice Frisée with poached egg salad as well. Not a bad start, but a premature finish. 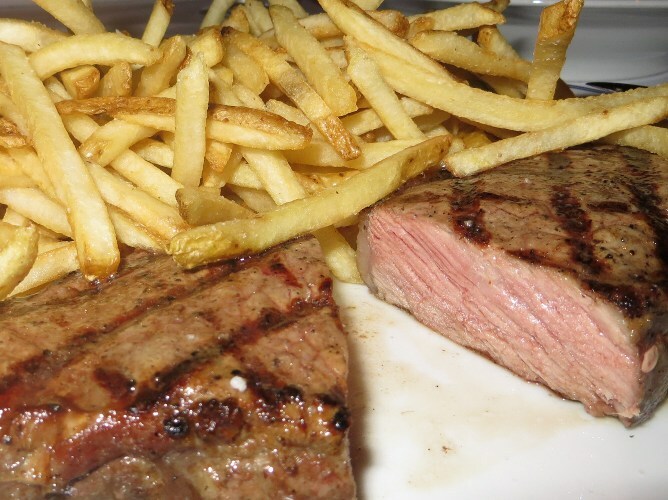 The steak frites of choice was a $45 grilled 14 oz of dry and flavorless NY Strip. It tasted more like a filet mignon. Very unfortunate and the other person who ordered it agreed. Mrs Ziggy’s beef short rib was a little better but uninspiring nonetheless except perhaps for some nice veggies and a ‘hint’ of handmade pasta surrounding it. A few months ago in New Orleans we tried 8 different bread puddings in 5 days. Bouchon’s would have been dead last in that race. An hour into the meal, since our main courses weren’t taken yet, you could tell that this would be a 3 hour marathon. And it was! Surely I didnt mind spending the time with my friends but it is important to note in case you planning to bring your in-laws here. Overall, Bouchon is another expensive reminder that the big name restaurants on the strip at times are just that, Big Names! I’ll make this one short and sweet. Not because I just had too much to drink this evening, but because I’m a bit under the influence and I’m afraid that the more I write the less sense I’d make. Milos lunch was a winner. The $20.13 lunch which is set to increase to $20.14 next year due to the corn market pricing speculation is one of the greatest deals in town. However, to make this truly worthwhile you need to add the $10 supplement for the terrific grilled Octopus app. Ever since we visited Portugal, the land of the most amazing octopus on the planet we’ve been on the hunt. This one is it. 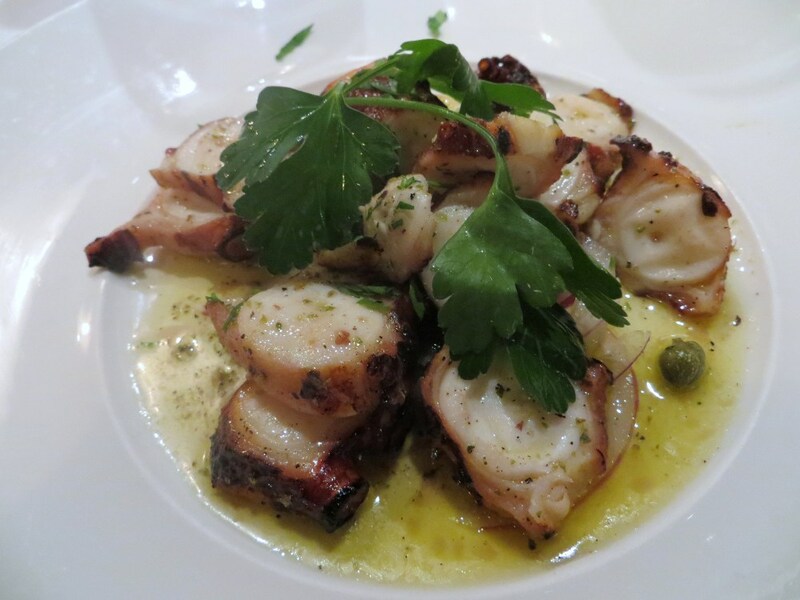 Meaty, perfectly grilled, perfectly seasoned with a hint of oregano, absolutely delicious octopus. Mrs. Ziggy thankfully enjoyed her tomato salad which meant she kept her fork on her plate for the most part. 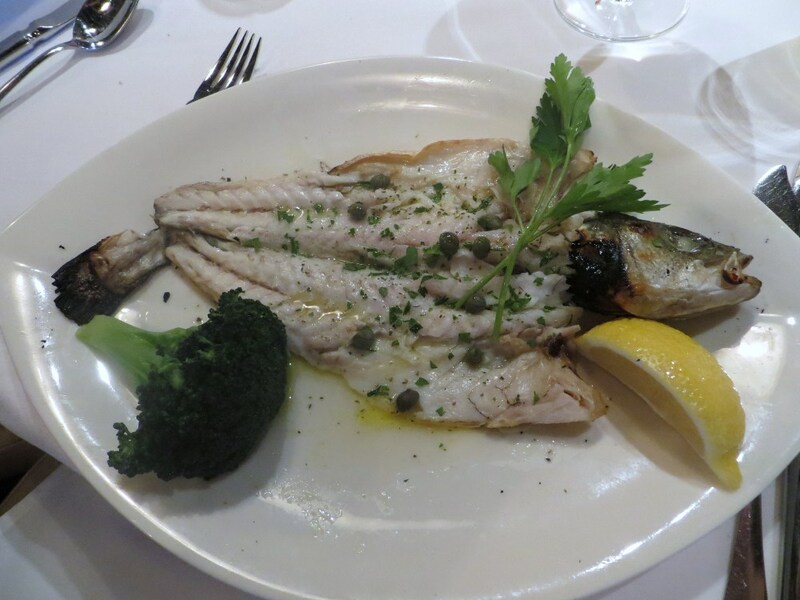 For main, the winner was the simply grilled Lavraki (bass). Quite a tasty piece of fish. The shrimp dish on the other hand was a bit too bland and the walnut pie, soaked in deliciousness was a nice finish The lunched so far are more satisfying than the dinners. Thumb up to Estiatorio Milos, aka Milos, aka don’t call me Estiatorio since no one can remember the first half of the name. I had to Google it just now. Anyway, nice beer, great food, a booth, Todd English food – that’s all you need after a long flight (anything longer than 2 with a terrified wife is long). We sampled some surprisingly terrific Pastrami, carved thick and generous (this is half a portion) and served with your choice of spreads. We got the mustard trio and the truffle mayo (very nice). Really enjoyed this dish. 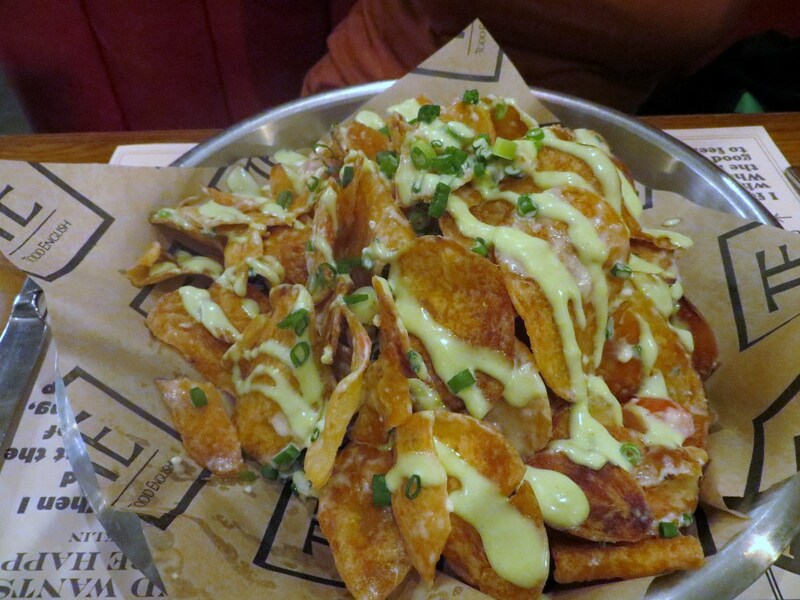 And their popular Junk Chips formerly known as Dirty chips since supposedly some people complained about the name? Say What? Nice nacho chips with melted blue cheese just enough to give it some tanginess without overwhelming. A mixed bag all around for this one. 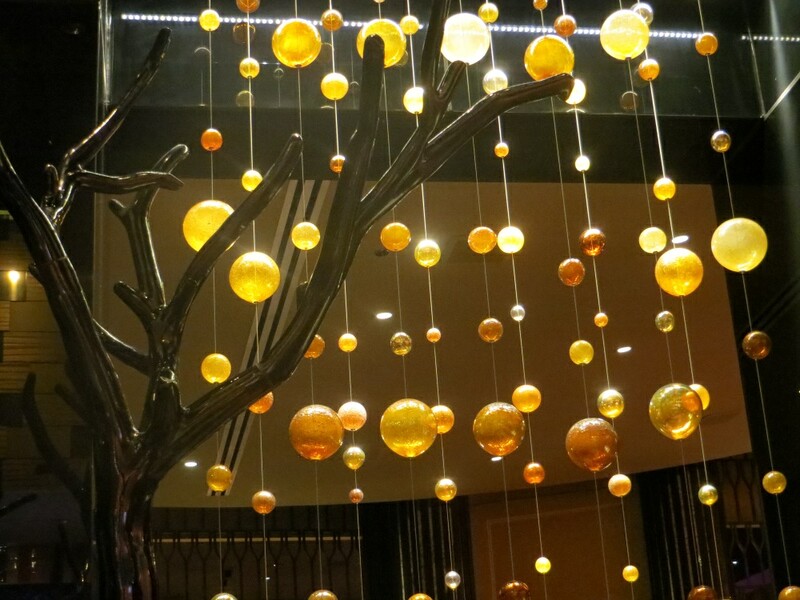 Julian Serrano also of Bellagio’s Picasso is one of many big names in Vegas. 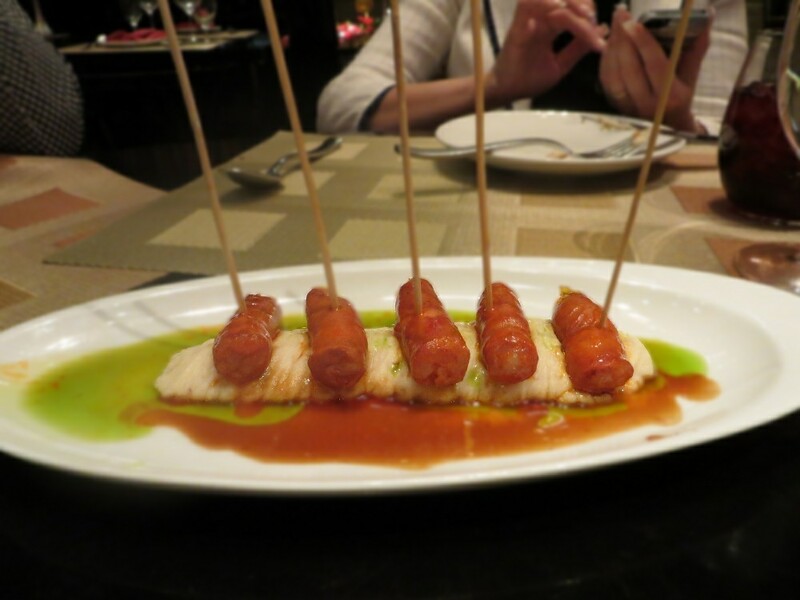 An impressive array of Spanish tapas fills the menu, both classics like the Gambas and Patatas Bravas and “new wave” tapas like those tuna cones we see surface in some places like in New Orleans’ SoBou. Julian Serrano definitely got the look. Although its near the main lobby in Aria and sort of a downer once you see the location. Between the 6 of us we sampled quite a few dishes. No issues with the service at all. I asked if they can bring the dishes in the correct order to accommodate the palates and they did. 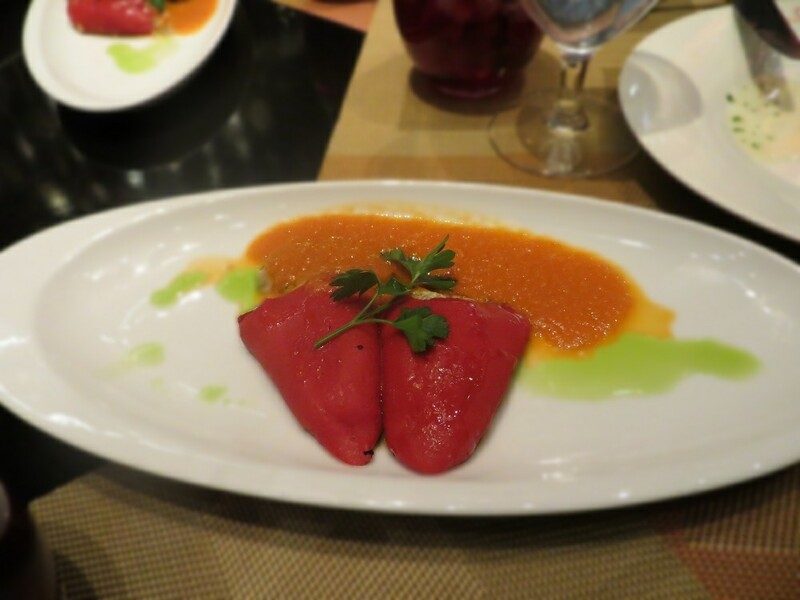 Stuffed Piquillo Peppers – A bit milder than expected but a pleasant start nonetheless. Huevos Estrellados – Enjoyed this one. 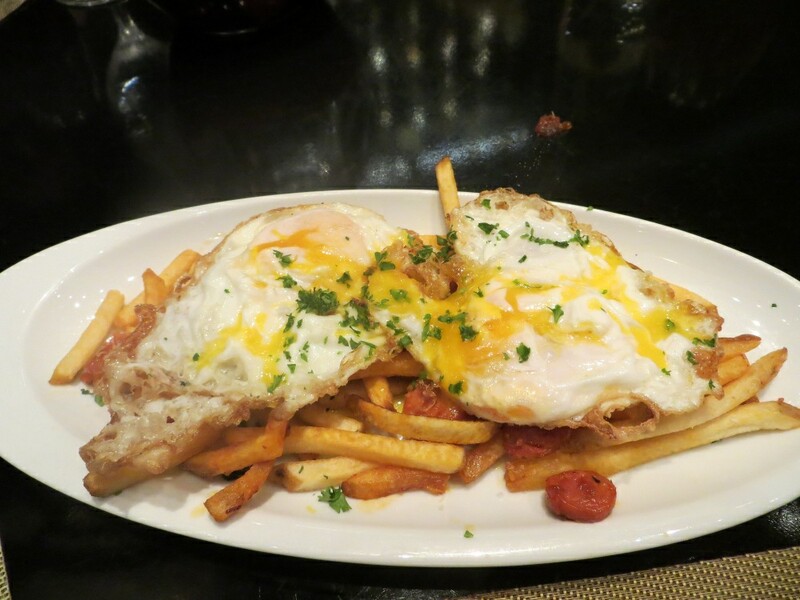 The chorizo along with the egg and fries worked together nicely. 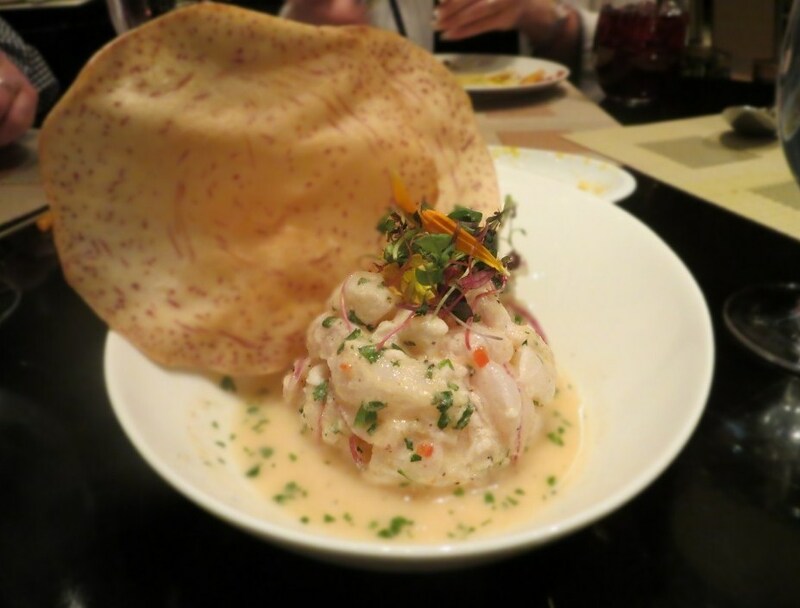 White Ceviche – perhaps the weakest link. I love ceviche but the acid here was just a tad overwhelming. A good size dish I must add. Stuffed Dates – this is one of my favorite Mediterranean tapa dishes and this one did not disappoint. Love the combination of those sweet dates with the bacon. Well done here. Croquettes – Ungood! flavorless, screaming for some sort of sauce. Creamy Risotto – Nice finish. Arborio cooked to al dente perfection and with the mushroom provided plenty of flavor. Along with the dates the best dish of the night. Funny how things work out sometimes. 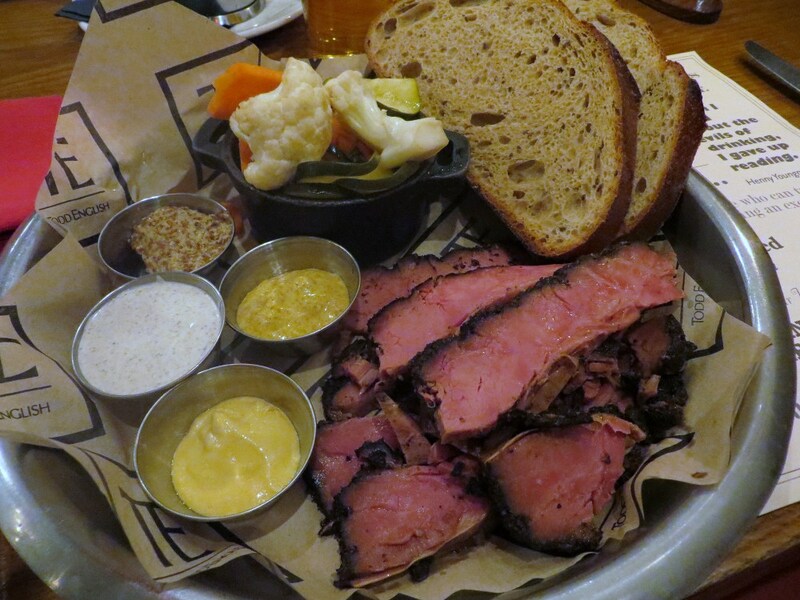 I’ve anticipated this to be one of the top meals of the trip from the info I gathered but at the end of the day, the pastrami at the next door P.U.B by Todd English was the most memorable thing I ate on day 1. Not a bad meal overall but not something I’d do again. 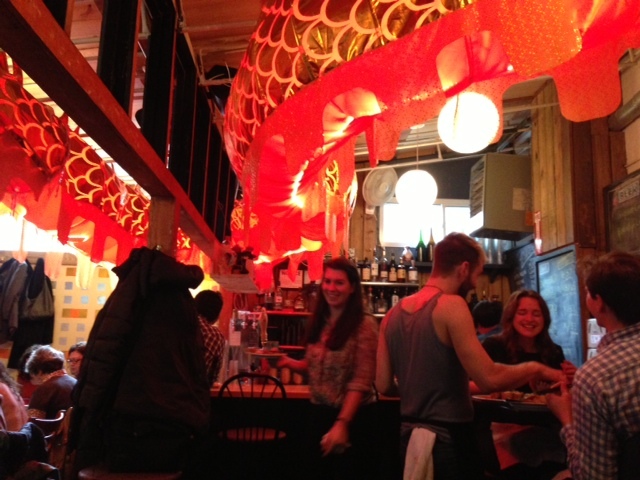 Perhaps I got somewhat spoiled with all the wonderful tapas we have in NYC (Alta, Tia Pol to name a few). This meal was a fresh reminder after a 6 year hiatus that the big name restaurants on the strip got just that. Big names. Getting there at 12:30 pm proved to be a perfect time – No Meshugenah line. While looking at the menu I was eyeing no less than 8 dishes for myself and my companion, The Hummus Whisperer, but settled on 6, still much to the dismay of the bartender who assured us we’ll be leaving with a hefty number of doggy bags. Ha! The joke is on him I’m thinking. He doesn’t know who he’s dealing with. 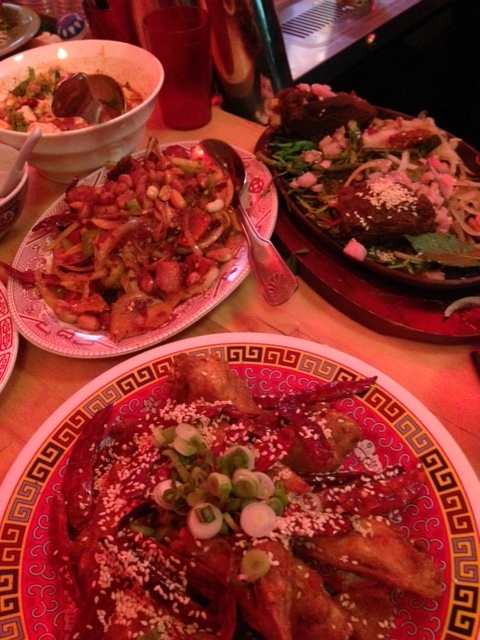 Chongqing Chicken Wings – Palates burst. After one, just one chicken wing, and that Tofu I needed to take a break. Those wings were super spiced and very intense. Thrice cooked bacon – I don’t know what to think about this one. It came with those “I cant believe its not potatoes Rice cakes” and after having a few of those at this point I started to wonder where the explosiveness is coming from. 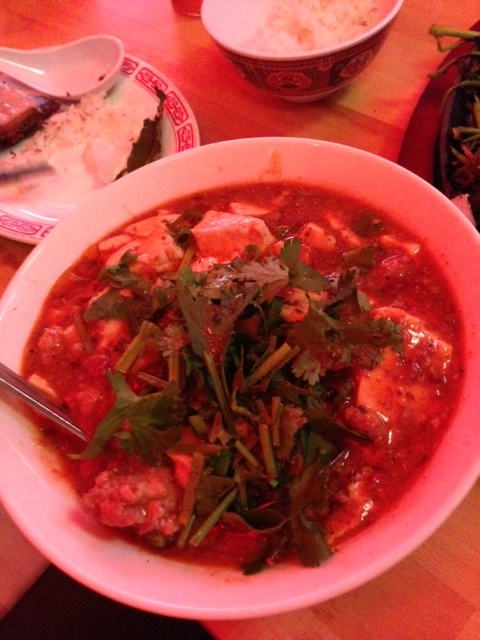 This was not one of my favorite dishes. Maybe they need to cook the bacon a 4th time. Salt Cod Fried Rice – Very good but why are we getting the mildest dish last. Loved the tiny Chinese sausage bits. This was a defeat like I never experienced. We couldn’t even finish the 6 chicken wings. My request for milk from the bartender resulted with just a grin. No, I’m serious, I want Milk. Whatever! I’ll be back for a rematch now that I know what to order and how to order it. I’m outta here. With the doggy bags! Aldea – Shrimp Alhinho – loved the dish, not the meal. Large succulent shrimp with a nice complex sauce. Well done! 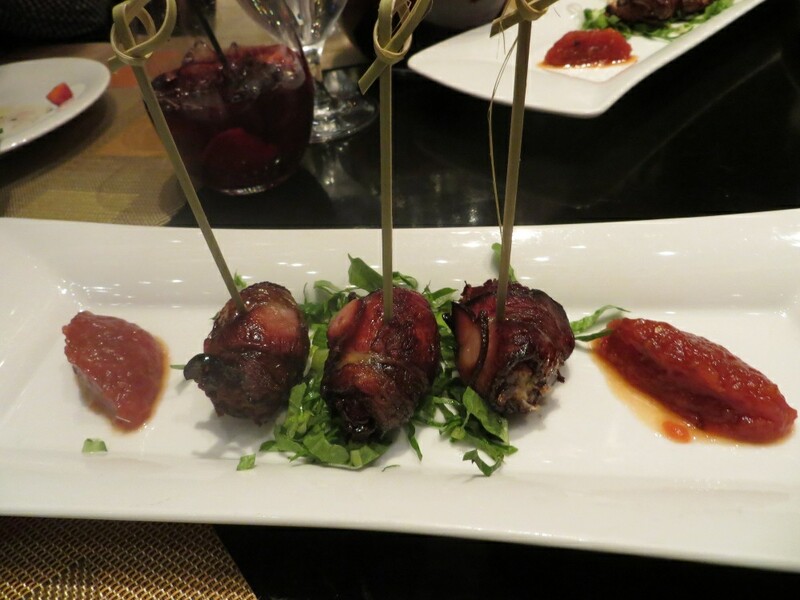 Alta – bacon wrapped dates. Skip the other half of the dish (the olives) and get more of these babies. Bacon never tasted that good. Gazala’s Place – Hummus with lamb and pine nuts. Nuttiest, creamiest, freshest Hummus I’ve had in NYC. Minetta Tavern – Black Label burger. Best burger we ever had. 50% of it is prime 48 day aged rib eye. Danji – Chicken wings. This gourmet Korean tapas joint serves some mean chicken wings. Cant wait to have them again. Ever since we came back from our 2 week stint in Israel, I’ve been on the hunt for good hummus like Mike Tyson seeking fine Orecchiette (baby ear shape pasta). I’ve had good Hummus at Mimi’s and Zion Deli in Brooklyn, Hummus Kitchen in Hells Kitchen, and a fine Hummus with Srug at Ta’im among other spots. But as soon as I tasted the Hummus with lamb and pine nuts at Gazala’s Place I was transported. The creamiest, smoothest, nuttiest, freshest I’ve had so far. Gazala’s Place is the creation of Gazala Halabi who brings her Druze recipes from Daliyat El-Carmel, a Druze village perched on Mt. Carmel. While in Israel we visited the Druze village next door, Usafia and had a memorable Druze hospitality lunch there while learning about their way of life. Gazala also dishes out large, herby, delicious falafel balls, nice fresh salads, and various tasty hummus and Hummus-like specialties like the pictured Foul Massary, fava beans with tomatoes. Their Bourekas of the day which I havent tried yet also looks terrific. I cant guarantee that this is the best Hummus in town but I can guarantee without a doubt that this is the best Druze with Russian waitresses in Hells Kitchen. Gazala opened another location on Columbus and shows her Russian fetish there as well. Check it out readers. Both of you!